I've had my share of difficulties with the AK platform. If you're not familiar with them, you can see where they all started here and check out my conversation about it with Tactigirl Lola here. A couple of bright spots in my AKM career were when Luke Williams of Circle 10 AK offered me a WASR, and when Frank McNitt of Home Front Defensive Devices offered to supply the compensator for my new rifle. HFD2 makes some excellent kit, I've reviewed their shotgun followers and .30 cal comp in the past. Their AK brake is the same excellent design as their standard .30 cal comp, threaded for the 1/14 LH pattern of the AK muzzle. 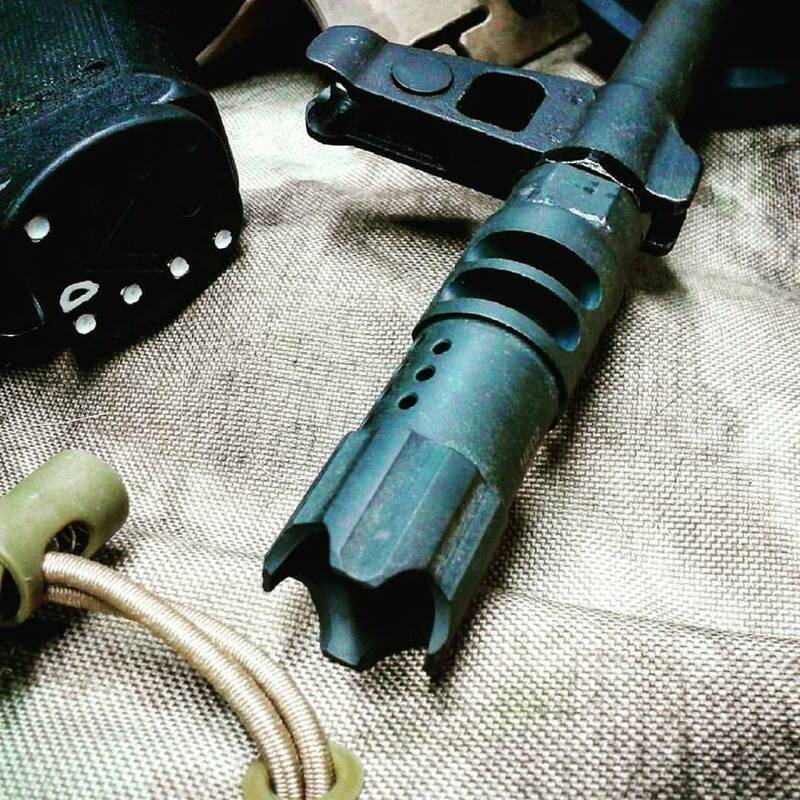 The brake includes a cutout for the detent that locks it in place as per standard AK muzzle devices. 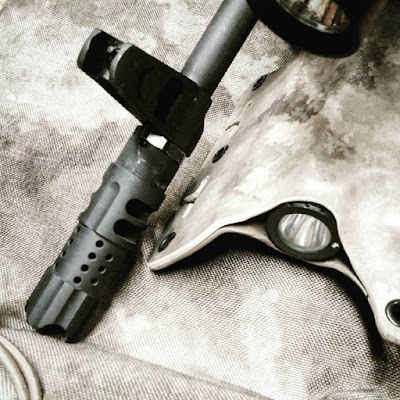 HFD2 also includes a crush washer for shooters seeking a tighter fit, as the AK platform tends to have looser specs and the brake may not time correctly on some out of spec muzzles. When I first installed the comp, there was a bit of play as with any muzzle device on my WASR. With most comps or brakes I wouldn't be too concerned, however the HFD2 comp is very long and I wasn't willing to take chances with a baffle strike while shooting. To be clear, the comp is bored out very generously, and the slight play wasn't enough to obstruct the bore, but I would rather be safe than sorry. I've already had enough fun with AK fails for one lifetime. I used one of the jam nuts Frank sent me instead of a crush washer for a few reasons. I wanted to be able to swap muzzle devices easily as I would be testing out several for review, and I felt the jam nut gave the brake a more solid lock-up than a crush washer. Installation took me a few minutes to ensure that I had the comp timed correctly, and then it was off to the range to see what this baby would do. Having shot HFD2's comp on my .300BLK, I had a good idea what to expect. I was not prepared. If you haven't watched the videos from the first paragraph, I suggest you watch the first and at least skim the second so you're familiar with the situation. Having an AK bolt break in near your face is really off-putting. Knowing that you probably lived only because the gun jammed on the next shot might even make you nervous about shooting another one. Yeah, I was a bit jumpy when I went to test this thing. Loading up a full mag and racking the charging handle, I found myself with an AK that failed to fully chamber the first round. OK. Dry gun, new gun, these things happen. I slammed the bolt home, and my heart was hammering as I pressed the trigger. The rifle did something... I heard the bang, I heard the case slap against the side of my Jeep, There was a nice hole in my target. But it felt like the gun misfired, or I had a squib round. I popped the magazine out, checked the barrel, and saw daylight. So I didn't have a problem. I put the gun back into action and fired off a few more rounds. Each press of the trigger told me the same thing. It felt more like I was firing .223 as opposed to 7.62x39. The compensator does a good job in reducing recoil as well as keeping the rifle flat shooting. While running several 1-5 drills, I was impressed with how easy the comp made rapid shots. With the slant brake, the rifle backed up harshly in my shoulder pocket and the muzzle seemed to jump around with each shot. With the HFD2 comp, all I needed to do was work the trigger and sweep the rifle from target to target. Design-wise, the comp is exactly the same as HFD2's normal .30 cal Blue Collar Comp, simply threaded for the AK and with a notch in the base to accommodate the AK's locking detent. For the sake of not making you click over to that review, I'll repeat the information here. Starting at the front, the BCC features an aggressive crown with four thick prongs that taper down to a thin edge. These prongs are sturdy enough not to bend when driven into a barrier, and are not sharp enough to snag or cut clothes or the inside of your gun bag. They are also short enough not to snag or catch on things during regular use. This is a smart design, as it allows the BCC to do what it needs to do without being a nuisance. That's one of the great things about HFD2's product line. The name "Blue Collar Comp" is not just a gimmick. It's a piece of gear that functions great and does a lot for the price, which is $46.95 with free shipping in the USA. For me, one of the brakes I consider great is the FSC series from PWS. It does a lot to mitigate recoil in a small package, although it is very concussive and loud. The price on these is generally $90-$120, depending on which one you get. The HFD2 .30 cal comps give very comparable recoil and muzzle flip control, for half to one-third the price. If you are going to be outfitting a whole fleet of rifles, budget is going to be a factor. It's a great brake at a great price. If you're looking for an effective comp that also looks wicked on your gun, you should definitely check out HFD2's line of Blue Collar Comps.